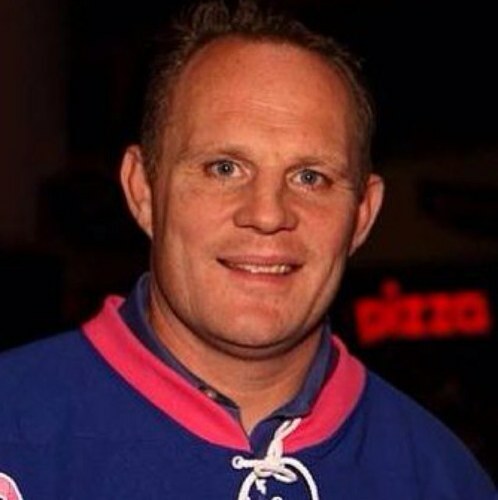 Q) Racking up over 700 penalty minutes for the Sabres AHL affiliate (Rochester), you made your NHL debut during the 1989-1990 season for Buffalo. On your first shift in the NHL you scored a goal. Tell us what was going through your head when you stepped on the ice and then after scoring the goal? A) It was the greatest day of my life. My dreams all came true at that point. And scoring was a bonus. 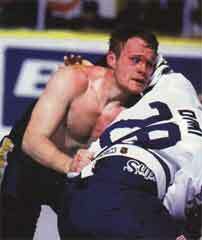 Q) The “Rob Ray Rule” is still used today in essence to the way you would take off your jersey and pads to make it harder for the opponent to get a grip during a fight. Did you see this as a clear cut advantage versus your opponent and are you surprised that they made a rule after it with your name? A) Yes, the jersey coming off was a great advantage. They had nothing to hang on to. Everyone I had to fight was bigger than I was, I had to find some sort of an upper hand or I would have got killed. The rule was cool, kinda like leaving a mark on the game something people will always talk about. Q) Speaking of fights, you have over 3,000 penalty minutes in your career ranking you on the top 10 of all time in the NHL. Clearly you’ve faced many opponents, but who is one tough guy that you always looked forward to dropping the gloves against and why? A) Loved fighting Domi. Always great fights and people loved it. Q) The game in Quebec was very memorable when a fan decided to jump on the ice, and up against your bench you beat him up until security finally grabbed a hold of him. What was your initial reaction when you see the random fan approaching you? A) What the f@&$ is this guy thinking. And then went into the “I need to stop him” mode. Q) From being drafted by the Sabres all the until 2002-2003 you were in their organization. You spent the last couple years of your career with Ottowa, but during the 90’s and early 2000’s was there ever an opportunity to leave the Sabres, or were you completely committed? A) I signed like 8 one year and an option contracts so every summer you were a free agent. Yes, there was plenty of opportunities to move. I had lots of offers to leave, but never wanted to until Darcy moved me. Q) Reputation being an enforcer, but you were awarded the King Clancy Memorial Trophy in 1999 by the NHL for your leadership and humanitarianism. What does that award mean to you in your career? A) The King Clancy means a ton to me. It speaks about you as a person not as a player and in the big picture life is more important than any game. Q) A few years back you were in a commercial for ESPN, and it’s probably one of the funniest that they’ve ever aired. Specifically who’s idea was it and lets be honest, how nervous was the guy who was the recipient of your punches even if it wasn’t real? A) The commercial was all ESPNs idea. I flew in one morning taped it and flew right home. The guy in the delivery uniform was a professional stunt man he was great and tough too. Q) Going into the sports broadcasting industry, what kind of transition was it from playing on the ice? Your now watching guys fight and you can’t be involved. Did you have moments where you wish you could just go defend the Sabres players down on the ice even after your playing days were over? A) I totally get excited still when a fight starts and yes there are nights I would love to get involved. The transition was and still is hard. There are guys that go to school to do this job, I had zero formal training. Every night I learn something new or screw something up, but it’s fun and very grateful for the opportunity. Q) What is your advice to students who want to get involved in the sport media industry? A) Have a back up plan. It is extremely had to break into this business. There are tons of people wanting to do it, but so little opportunity.